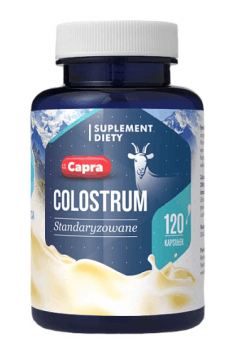 Hepatica Capra Colostrum is a dietary supplement which contains 500 mg of dried colostrum in one capsule, standardised for the high content of immunoglobulins (27%). The product contains a unique colostrum obtained from the pure colostrum of the first goat milk, whose composition resembles human milk. Colostrum is the first milk secreted by female mammals during labor and for the first few days after it. It supports the proper functioning of the immune system of newborns which is not fully developed yet as well as the passive resistance to pathogens. On the first day after birth, the females of all mammals, including goats, can produce enough colostrum to fully satisfy the needs of its offspring. The excess of colostrum, especially if it is of high quality, can be stored and then used not only for feeding farm animals, but also as a part of the human diet. The composition of colostrum depends on many factors, such as animal species, breed, genetic features and diet. The composition of colostrum resembles human milk. Its main advantages are high content of minerals (phosphorus, potassium, magnesium, sodium and calcium), vitamins (A, B1, B2, B6, C and E), enzymes, proteins, fatty acids, the presence of immunoglobulins, lactoferrin, lysozyme and lactoperoxidase. Immunoglobulin is a protein secreted by B-lymphocytes during the humoral immune response. They are characterised by the ability to specifically recognise antigens. Immunoglobulins play an important role in defending the body against pathogens by binding the antigen and allowing its phagocytosis, stimulation of immune reaction, bacteriostatic action and neutralisation of toxins and viruses. Lactoferrin is a protein from the group of transferrins. It plays an important role in iron absorption through the intestinal mucosa, participates in phagocytosis and has a major impact on the immune response of the body. By binding iron ions, it makes them inaccessible to pathogenic bacteria. Lysozyme shows bactericide properties. Its activity is increased by immunoglobulins and lactoperoxidase. Lysozyme penetrates the outer cell wall of bacteria, which results in its degeneration. Due to differences in structure, lysozyme is more effective against the Gram-positive bacteria. Lactoperoxidase shows strong bactericide activity against the Gram-positive bacteria and bacteriostatic activity against the Gram-negative bacteria. Moreover, some viruses are sensitive to the toxic properties of this protein fraction. For better immunology support and infection fight, it requires interaction with lactoferrin. The only way for newborns to obtain the proper immunity is feeding with colostrum. Colostrum stimulates the digestive system; reducing the risk of infections positively affects metabolism of young mammals. Bactericide and bacteriostatic substances, including immunoglobulins, lactoperoxidase, lactoferrin and lysozyme, complement the colostrum composition making this substance a wonderful preventive and therapeutic agent, which supports the immune processes in children and adults. Scientific studies, tests and observations of people using colostrum confirm that the substance promotes physical effort. The most popular reports demonstrate that supplementation with colostrum raises body system capacity during prolonged effort, shows antioxidant properties, supports intestinal barrier functions and promotes nutrient absorption. Support, development and maintenance of natural body system defence and avoiding breaks caused by infections, it promotes sport progress and allows for high intensity and continuity of trainings. To sum it all up, Hepatica Capra Colostrum is a dietary supplement, which is an effective alternative for agents supporting immunity improvement, due to the high content of immunoglobulin and other biologically active proteins. The product can be also effective in case of higher risk of infections and during antibiotic treatment. Apart from that, colostrum is effectively used in sport nutrition and supplementation. Take 2 capsules twice a day on an empty stomach. Colostrum is a 100% natural substance, so that its supplementation is safe even for a longer period of time. Dosage depends on the aim of the supplementation. Preventive doses can differ from those recommended by the manufacturer, and in case of infection symptoms they can be increased and applied as long as the symptoms persist. Stabilizer - hydroxypropylmethylcellulose (capsule shell). Colostrum, also called foremilk, is a liquid secreted by milk glands of mammals, created in the last stage of pregnancy and produced up to several dozen hours after delivery. Its task is to protect a newborn baby from pathogens. In comparison to milk, it is much more concentrated, enabling proper development of a child. Bovine colostrum offers unique benefits for the immune and digestive system, both for babies and adults. The richness of active substances makes colostrum an incredibly effective, natural agent supporting defense mechanisms of the organism. An incredibly important function is played by immunoglobulins, lactoferrin, proteins and growth factors. Additionally, the application of colostrum is beneficial i.a. in the course of gastrointestinal ailments, infections with H. pylori, infectious diarrheas and it also demonstrates neuroprotective and anticancer properties. Supplementation with colostrum effectively strengthens weak organism, which makes it work well in case of lower immunity and increased susceptibility to bacterial and viral infections.